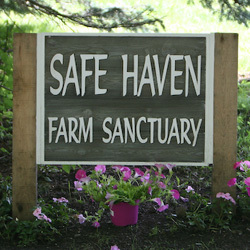 Safe Haven Farm Sanctuary is a 501c3 not for profit corporation. Our EIN is 80-0150359. Your donations helps us help the animals. Thank you for what you donate – every little bit helps. Minimum donation is $5.00. Your donation helps our animals. We need to pay for animal food, vet bills, heat in the barns over the winter, electricity, and all the facility upkeep. We appreciate all donations (minimum is $5.00).